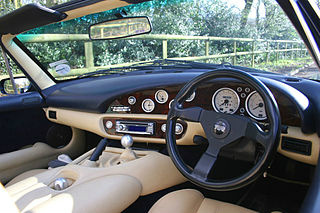 The Chimaera sports car, a two seater convertible, was launched at the British Motor Show in 1992, and was designed to be more of a GT than its sister model, the Griffith. 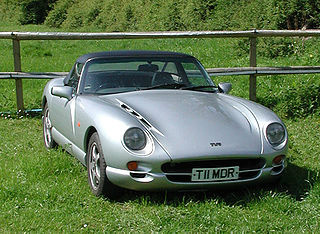 The body styling of the Chimaera followed the format of the classsic TVR S-Series and, between 1993 and 1998, it became the best selling TVR of all time, far exceeding that of the enigmatic Griffith. Although, at that time, the TVR S-Series was sellng well, it soon became apparent that, in the Griffith and Chimaera, the future of the company was in V8 powered sports cars. The addition of a larger boot, rear anti roll bar, and softer suspension emphasised the long distance Grand Touring image of the Chimaera. 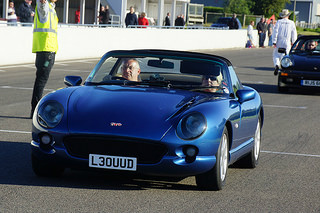 Although the car was planned to be powered by the all new AJP8 engine that had been designed and built by TVR, development difficulties prevented its addition. Furthermore, it was decided to replace the Griffith with the Chimaera, but due to the success of the former, this did not materialise until 2000. The 4.3 litre variant was replaced by the 4 litre high compression unit, which itself was replaced by the 4.5 litre in 1996, with the basic 4 litre being phased out in 1998. 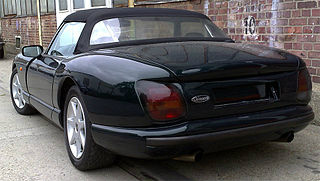 The top of the range 5 litre variant was introduced in 1994 on the back of the phenomenal success of the Griffith 500. The Chimaera sports car was first produced very early in 1993, whilst UK production of the Griffith was temporarily halted in December 1992. 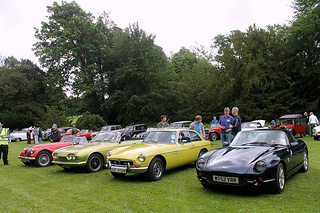 The 4 litre and 4.3 litre engines were fitted with a catalytic converter in accordance with 1993 regulations. In 1994, the gearbox of the Chimaera and Griffith 500 was changed from the Rover SDI unit to the Borg Warner T5, a much more robust unit. In 2001, it received the enclosed headlight assembly as used in the Griffith, in place of the existing recessed style, and minor suspension changes to improve road holding and ride. The 4.5 and 5 litre variants displayed "450" and "500" badges, positioned at the rear of the car, although the 4 litre version was only fitted with a plain Chimaera badge. Up to 1997, both Griffith and Chimaera used pressure on a silver disc at the top of the rear wing to open the doors from the outside. From the inside, a gnarled twist knob near the handbrake was turned to open either driver or passenger door. After 1997, a small electronic push button on the underside of the door mirrors opened the doors from the outside. 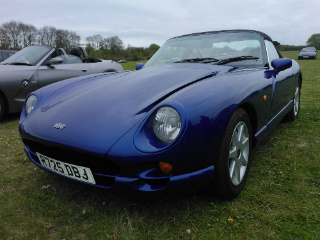 The reason for the change was that TVR wanted the exterior of both cars to contain smooth, uninterupted lines with no protrusions. Even the filler cap was situated in a small recess under the boot lid. In 2001, it was finally retired, and the Chimaera 450 sports car was the only variant being built at the end. Over 6000 units were produced, but only about 600 were the Chimaera 500 variant. These highly desirable cars were distinguishable by their rocker covers being coloured purple, and by their very distinctive Griffith style wheels. The presence of over 6000 Chimaeras meant that this single model accounted for more cars than the company had produced over the previous twenty five years. A high mileage Chimaera would fetch in the range £6,000 to £12,000, with a low mileage version selling for £15,000 to £20,000, and a really exceptional example would command in the region of £35,000.